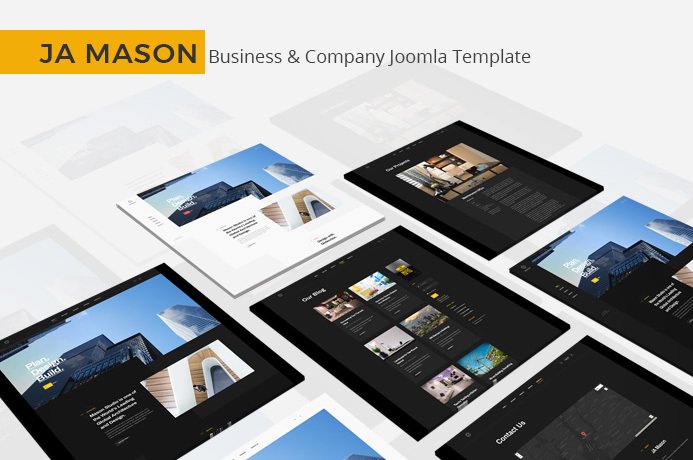 JA Mason is a dedicated template designed for Business and company websites. With powerful features and easy way of customization. You can create a project page with multiple Menu support, Mason Joomla template gives all options that required to build a business site, There are dedicated pages for Project, Blog and Contact. The Company and Business Joomla template is responsive and works well with all devices based on powerful bootstrap 3 responsive grid system. Its easy to customise the layout with T3 framework. The template comes with two pre-built dark and light themes that give the business website an attractive look.ThemeMagic option have the ability to create more new themes with few clicks. The template comes with two flexible menu system with the sticky Vertical menu and horizontal. Both the Menu support T3 Megamenu options to customize them menu style. The Mason Joomla template comes with specially customized styles for all Joomla default pages: Joomla login page, Joomla articles pages and 404 page. JA Mason supports the right to left languages that allows you build a website in special languages: Arab, Persian, etc.